This is 10 Tips for Teaching a Reluctant High School Writer part 2. If you missed the first post with tips 1-5, read it here. No matter how old your reluctant writer is, several of tips 1-5 apply! 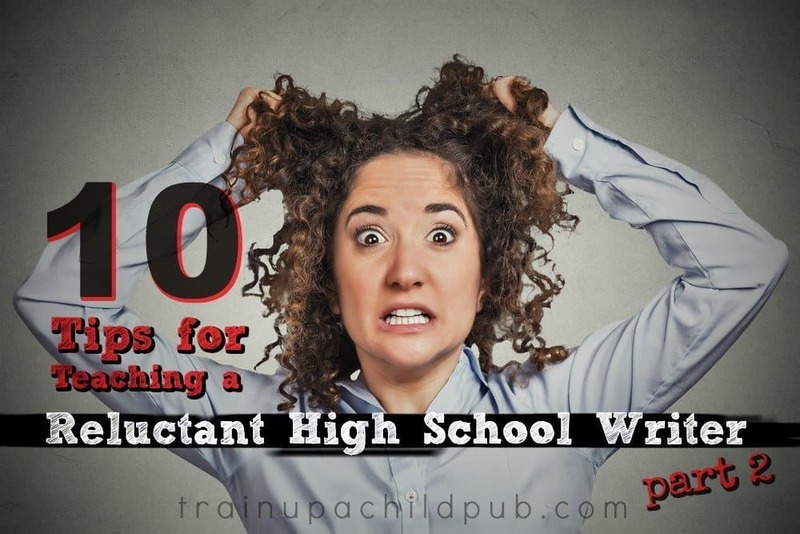 Continuing now with tips 6-10 in teaching a reluctant high school writer. 6. Ask for your high school writer’s help. I know this sounds odd, particularly for a reluctant writer. However, when a student perceives himself as needed, it builds confidence. Try asking your high school student to help out. You’re obviously busy, so maybe your high schooler could read and edit a short assignment from a younger sibling, or even something you’ve written. Obviously, you don’t want to ask him to do something that is beyond his ability. So be sure to work through basic self-editing skills first. Why all of this focus on editing? Students who can edit their own work tend to feel more confident about writing. Although editing is a different skill than writing, it’s not uncommon for a reluctant writer to understand how writing should look. (Even if he’s not so excited about writing.) As well, the more editing practice, the better the writing skills later. Consider writing projects or paired writing. Often high school students will contribute more and gain more confidence if they are not writing alone. Discuss this with your student prior to making any decisions. If your student is adamant about not wanting to write with another student or sibling, don’t push it. In our experience, however, most students feel less pressure when more than one person is involved, especially if s/he’s writing with another student. 8. After reviewing the basics, teach your high school writer the 5 basic essay types. The basic high school essay styles (expository, narrative, persuasive, comparison/contrast and descriptive) are vital for high school students to master. Take your time and work on them over the period of a year. Preferably, your student’s ninth grade year. Work on the styles one by one moving from simplest in form (expository, narrative and descriptive) to more difficult (persuasive and comparison/contrast). Most students like certain styles over others, which is natural. Be as encouraging as possible when your student finds a style that fits his personality. In fact, consider adding an additional assignment to fit that style. It will build confidence. Allow more time for the styles that do not appeal to your student. Before beginning any essay writing, read through examples of essays in that style to help your student have a very clear understanding of the format. Reassure your student that there will be multiple draft opportunities to get it right. Outlining is essential for every student (different outline types are discussed in our Teacher’s Manual for 6th-12th grades). Mastering this skill will provide structure and again, build confidence in a reluctant writer’s ability to get the assignment completed. Vary essay lengths. Many schools push the 5 paragraph essay and yet, most colleges prefer a student with a more varied writing style. Encourage your student to write shorter and longer essays. You may even want to start with a mini-essay of only three paragraphs. Descriptive essays are good candidates for this writing assignment. No matter what writing curriculum you use, feel free to modify as needed for your student. Be patient. Yes, the clock is ticking, but in four years of high school there’s plenty of time to include a wide variety of writing experiences into your student’s curriculum. Also remember that your student will grow and mature more in those four years. So you need not tackle every problem in the freshman year. My reluctant writer grew exponentially in his writing ability over those four years! In fact, he derived great pleasure in college by passing along a comment from an English teacher who had commended him for writing on the same level as a graduate student! Who would have thought?! Take courage, Mom! 9. If possible, work in two research papers during high school. Research papers are a fact of high school life. The great thing about a research paper is that you break it down into smaller components and work on a little at a time. Most students take a semester to write a paper, but for a reluctant writer, it could take a little longer. There are no rules about how long it should take, but ideally, a college bound high school student should have two research papers under his belt by graduation. For reluctant writers, the topic will make all of the difference. (See tip #2!) With your student’s first research paper, most definitely allow her to select the topic. You may want her to give you a list of possibilities and you help narrow it down, but it should be topic of interest. Keep the first research paper shorter (6-10 pages) for a reluctant writer. Reassure your student that she’ll have PLENTY of time to get the paper finished and you’ll break it up into small pieces with deadlines throughout the semester or year. Then stick with those deadlines as much as possible. If there is an issue keeping the deadline, don’t let it be because you didn’t have something graded on time, didn’t get your student to the library, etc.). Additionally, nothing is more discouraging to a student than telling him his commitment to his work and your deadline is critical, but then making him wait forever to view and evaluate his work. Consider grading each segment of the process, because there is less pressure with multiple grades than one major grade. Once your student is familiar with the research paper format, try to fit in a second paper. Tackling an academic topic at this point would be fine. If you could use some help teaching the research paper format, we have a course for that. 10. Look into writing courses. Sending a reluctant writer to a writing class may seem odd for a student who is already insecure about his abilities. Actually, though, we’ve found that sometimes male students, in particular, respond better in a structured, class setting. They often work harder because they do not want to look bad in front of their peers! Whether you teach your student yourself or find another instructor, know that reluctant writers tend to achieve more with teachers who have a sense of humor and are encouraging, without allowing the student to deviate from the course. Grace and understanding when a student is struggling, balanced with accountability, is not always an easy combination of traits to master, but definitely worth the effort. If your relationship with your reluctant writer is strained over this subject, consider finding another writing teacher for a season, at least. Make sure to discuss the issues with the instructor ahead of time. Teaching a high school student is truly a sacrificial act for many parents. When that student is a reluctant writer, the jewels on the crown increase exponentially! Just remember that this is only one aspect of your student. And you both will make it through with prayer, patience, practice, and time. God bless and know that the fruit of your labor will not go unnoticed! Don’t forget to go back to read the first five tips here. Are you struggling this year with a reluctant high school writer? Which of these tips might help?